Want to Buy a Home Before the End of the Year? Want to buy a home during the second half of the year? Although there is less inventory than the height of the spring selling season, you can still get a great house if your goal is to purchase a home before the end of this year! Here are the six things you need to keep in mind if you are buying a home during the second half of the year. There are yearly cycles to the real estate market, where inventory and availability goes up and down. Generally speaking, the largest amount of homes are for sale in the spring months, with the highest inventory towards the end of May (see graph below). 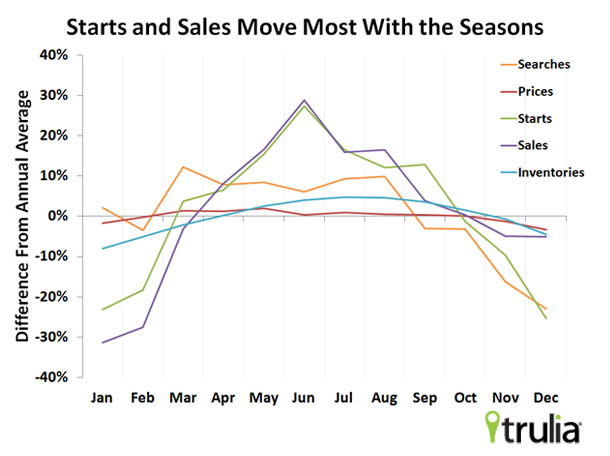 Notice also, that November, December and January are the lowest inventory periods of the year. That doesn’t mean you won’t find a home; that just means there are fewer options this time of year. Things will change if you are able to wait until February or later. But, you want to be prepared when the perfect house for you does come along, so here’s how you can make sure you don’t miss a great home this time of year! Day dreaming is actually an important first step because how else will you know if you’re headed in the right direction, if you don’t know where you really want to go? What matters most to you? Walking to work? Well, then that determines your location. Do you love entertaining but don’t have space in your current place? Then make this a top priority. Really think hard about your day-to-day life and what you want in your next home. I personally must be able to walk to a gym and a grocery store – silly, I know! But after two years of aimlessly searching, I bought a home the very day I figured out that requirement. So what are your “silly” must haves? They matter, so do not skip this step. Really get to know the locations in which you are considering. And you should make this fun! Go there for your normal activities such as coffee with friends or grocery shopping. You should even take your kids to the different playgrounds or try the local restaurants. Visit open houses to get a sense of pricing for the space and location. This will help educate you about the local market. My only word of advice and caution about attending open houses: don’t fall in love with any house and buy it before moving on to step #3! Today, lenders are more like mad scientists with large magnifying glasses, examining loan applications more closely and carefully than ever before. Plus, a good credit score is the most important factor when trying to get a low interest rate. So now is the time to monitor your credit and take the time to repair it. Don’t even think about making a big purchase like a car in the upcoming months! Owning a home requires a slew of extra, and sometimes unexpected, costs such as utilities, maintenance, and repairs. Make sure you budget accordingly and start working on your credit ASAP. Did you know that a $10,0000 change in your purchase price only changes your monthly payment by about $40? Amazing right? That said, go through your budget, determine what you can pay and WANT to pay per month toward your new home. Those two factors will determine your purchase price, NOT the other way around. Want to crunch the numbers? Check out our Hip Homeowner’s Guide to Calculating Payments and Mortgage Calculator. This is a big one! Of course buying your first home is scary! Buying a home is probably the biggest financial decision you’ve made in your life so far. That’s why you should definitely take time to go through each of the steps we’ve outlined above. If you start taking these important steps now, when the time comes to pull the trigger, you’ll do it the right way and feel more confident and comfortable about all your decisions along the way. Now enjoy the hunt! Want more information about the home buying process? Check out our Buying a Home 101 series that outlines the 12 steps throughout the home buying process, from choosing an agent to after you move into your home.